Tube-top mama nearly six feet tall, she is the fox of the shopping mall. A buried treasure from 1990, drenched in irony (or is it? ), is this week's Counterbalance. Klinger: I haven't quite crunched all the numbers, but I'm pretty sure that 1990 is the least critically acclaimed year in pop history. Just about every other year from 1966 to 2004 (what arguably constitutes the LP era) has at least one album in the Great List's Top 100, but the highest ranking LP from 1990 is Public Enemy's Fear of a Black Planet at No. 131, and then you don't see anything again until Happy Mondays show up at No. 345. Fascinating! This post-punk, pre-grunge era is seen as a fallow period for pop, one that was safe for Paula Abdul to roam the earth. 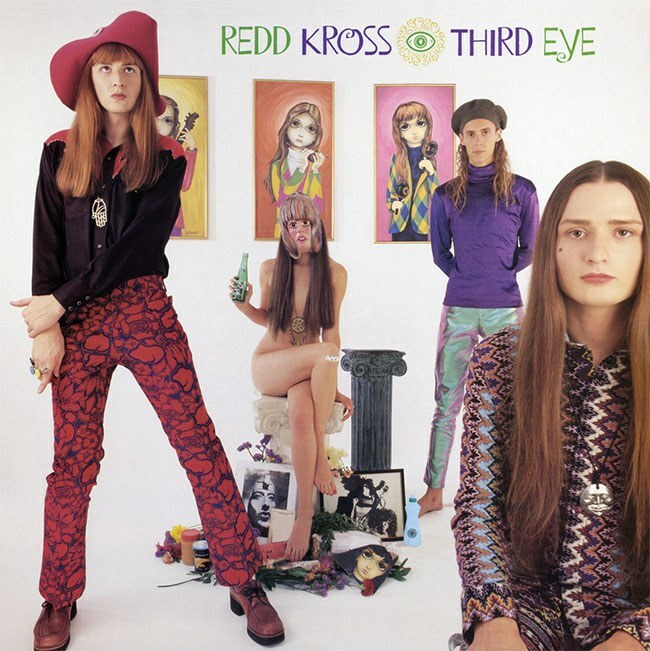 And yet, there was some exciting music being made during that time, and I've chosen this album by Redd Kross as an example. I was actively involved in my college radio station around this time, and this record caused quite a stir among our irony-drenched, pop culture-obsessed Gen X cohorts. We were heavily drawn to the Cheap Trick-meets-punk sound and their possibly-no-longer-ironic appropriation of thrift store paraphernalia, especially at a time when this brand of nostalgia had yet to go mainstream. Plus this album just flat out rocked, managing to use their major label backing to create something that seemed unusually huge among our homemade cassettes of local bands and shoestring-budget EPs. Having done this Counterbalance thing for so many years, I wanted to shine a light on what I feel is an underappreciated gem from a forgotten era. So I hand it over to you, Mendelsohn — how do you think this album stands up today? Mendelsohn: In a word: dated. This record sounds like hair metal and early alternative got together and made a baby and that baby grew up to be a gangly, skinny dude with long hair who thought it would be a good idea to cut and curl his bangs and then make a music video, which was then saved for all posterity on the Internets. The “Annie’s Gone” video is a garish freak show, Klinger. I can’t figure out if its authentic or an elaborate joke. If it is a joke, please fill me in on the punchline. Klinger: I haven't seen the video. I didn't have cable back then. But I'll say it's both. An authentic, utterly sincere elaborate joke on everybody. Mendelsohn: I think there is a reason for the lack of albums from 1990 on the Great List. That reason being, somebody decided to give Redd Kross major label money — probably the same somebodies who let Paula Abdul out of the loony bin to do a freaky dance number with an animated cat. Am I remembering that right? Or was it a dog? I don’t even want to check but now it’s going to bother me all day. It’s not like this record isn't without its merits -- these guys know the ins and outs of rock, but something always seems to go a little awry. Example: “Elephant Flares”. The song rocks. But then they drop the chorus about driving down the highway in their Trans Am with the custom T-Tops, blasting the BTO, and I completely lose it. Klinger: Well, now, there you go. You have to have the context that comes from knowing that at that time the cultural detritus of all things '70s — even the obvious stuff like that — was met with condescension and revulsion, and records like this were on the first wave of celebrating them in a way that blurred the line between irony and earnest appreciation. They did write a love song to Zira from Planet of the Apes, after all. Third Eye also works both sides of the street between indie cred and the mainstream — decades before this whole "poptimism" wave that causes today's critics to adore Taylor Swift and Haim. I refer you to "Debbie and Kim" here, which weaves the twin icons of Mses. Gibson and Gordon into one huge pop confection. I have no idea what Atlantic was thinking when they cast their lots behind Redd Kross. The major label feeding frenzy was still a couple years down the road, and it's not like the MacDonald brothers were the second coming of R.E.M. Redd Kross really did seem to be pushing buttons here, forcing both sides to question what they were up to. Apparently they still are. Mendelsohn: Yeah, I have lots of questions. Is this revenge for the week you had to spend listening to Haim? Couldn’t we have just listened to a Cheap Trick record? Maybe I was being a little too diplomatic just now. You asked me earlier if it stands up today and I got a little sidetracked thinking about Paula Abdul. I don’t think it does. It may be a forgotten gem from a bygone era, but if all Redd Kross is able to do is make us question their motives, then are we more concerned about the elaborate marketing ploy or the music? If it’s the music, I’m not so convinced. Yes, they have a handle on writing steady, pop-influenced rock, but does it go beyond that? Record labels used to take weird chances on odd bands from time to time (can you believe Warner Brothers keeps giving money to the Flaming Lips?). I just trying to figure out why Redd Kross. Was somebody hoping for the next big thing? Is Redd Kross a Nirvana without the nihilism that brought a generation together? Klinger: I just got done saying that I don't know what Atlantic was thinking. And Nirvana's lawyers were probably still hammering out the details with DGC when Third Eye came out. But anyway, while this isn't exactly revenge, it is to some degree a response to my week with Haim. Because it serves as an object lesson about both the tendency toward nostalgia for a time that you just missed out on (the go-go '80s for Haim, Nixon-era day-glo for Redd Kross) as well as the way in which ironic detachment informs that nostalgia (doe-eyed earnestness for Haim, a complicated mix of mockery and appreciation for Redd Kross). I have a hard time listening to music made by Generation Xers without seeing it through that prism, whether it's these guys or the Beastie Boys or the Wu Tang Clan. So when they do a song like "1976", which makes what may seem easy references in the wake of That '70s Show, I tend to see past that and get the original creative impulse behind that. And then when it busts into a note-perfect Paul Stanley vocal impression, I can stop thinking about the sociology of it all and just let the rock happen. Also I recall hearing that song and thinking to myself that maybe the '70s weren't quite the nauseating polyester horrorshow that I remember. In 1990, this felt like a bold, brazen album and nothing at all like an elaborate marketing ploy, although just a couple years later it felt a little ahead of its time. I guess you had to be there. Mendelsohn: I was there. But I was still playing Pogs and watching Tiny Toon Adventures. So trying to dissect Redd Kross’ intention at the time would have been nearly impossible. I probably would have wanted to know what was wrong with that ugly woman. We have talked at length about the reappropriation of early styles, which are then reconstructed and repackaged for a new generation. It seems that Redd Kross was ahead of the curve in that regard, especially when it came to 1990s alternative rockers and their love of Cheap Trick and the 1970s in general. Although, one might argue, others were able to do it much better and to a higher degree of success. Why no critical love for this record? Why aren’t Redd Kross the New York Dolls of the 1990s alternative movement? Klinger: Hell, I don't know. Major label dogma among critics? Overly slick production on this album? Or maybe Redd Kross just had a few too many pop hooks (and ugly pointy guitars) at a time when the music world was looking for something darker and angstier. Doesn't matter. A lot of great albums have slipped through the cracks over the years. Bands just somehow manage to not catch the zeitgeist of the mainstream, but then again I don't think that's necessarily a band's job. Say what you will about Redd Kross (and you have), but it doesn't seem like they were setting out to do much more than bring their campy sensibilities to a somewhat larger audience.